One of the things I really wanted to put into Specimen is the horror flavor. This is the hardest thing to incorporate into a horror game. I mean, really, how scared is a gamer going to be sitting in their well lit home, with their friends, playing a game? Let’s face it, the “I’m scared” factor in a board game is always going to be low, but I still wanted to try. The Panic Chart in Specimen. One of the things I came up with is PANIC. It always happens in the classic horror stories that some of the characters just lose it when they confront the monster. To simulate this, I came up with the Panic check. I decided that after three of the seven crew members have been killed, the survivors would start to realize that their odds of making it were not good. 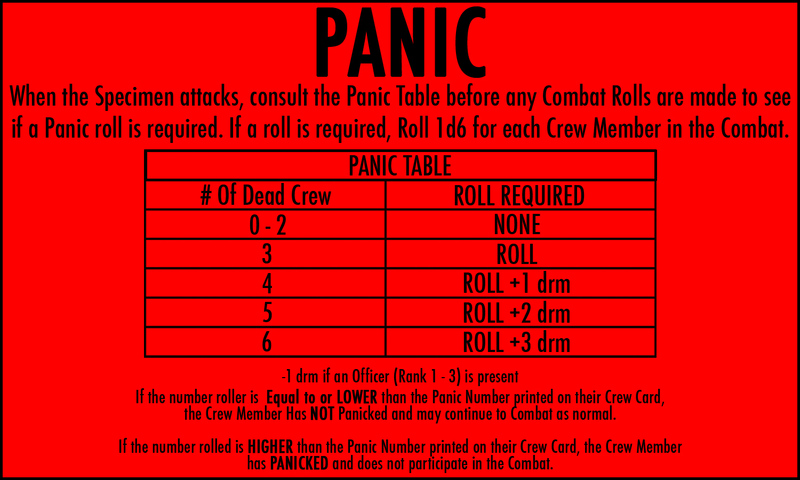 From that point on, whenever the monster attacks, each crew member in the combat has to make a Panic check. If they roll their panic number or lower, they pass and can fight as normal. If they blow it, they don’t fight and instead just stand there, frozen. Some crew members are cooler under fire than others. Captain Tyler has the best panic number, while Whitaker (poor Whitaker!) has the worst. Does it give the Specimen an advantage during the later stages of the game? Absolutely! But at that point in the story, the monster should have an advantage. Please visit Kickstarter to pledge to our campaign. At least I had some semblance of control while we were preparing everything. Now, it’s up to you guys. Oh sure, Joe and I will be furiously tweeting, blogging, and posting on Facebook, basically doing everything we can to get people interested. But really, a board game like Specimen will either appeal to you or it won’t. So, now begins 30 days of prodding, poking, and cajoling to everyone and anyone I can find to support this project. That being said, visit www.kickstarter.com/projects/toxicbag/specimen-board-game to donate to the kickstarter. Please, take a minute to check out the rewards we have for pledging at different levels. And if you think the project is as cool as we think it is, please consider pledging a few bucks. You can be part of the Specimen Community and help send this great, fun game out into the world! Every little bit helps, and Joe and I will be very grateful. Finally, I can’t express enough how proud I am of all the hard work and contributions I’ve gotten from everyone involved with Specimen. You guys listened to the crazy ramblings of wide eyed, obviously mentally impaired or over-medicated bald guy and somehow turned them into a really cool, slick looking game. And for that, I will be eternally grateful, whatever Specimen’s end. And so far in the first day, we’ve raised over one thousand dollars! Well, we’re on our way!